"This was a fascinating tour, providing an overview of the great contrasts that comprise China. It has changed my attitudes and further stimulated my interest in the country." 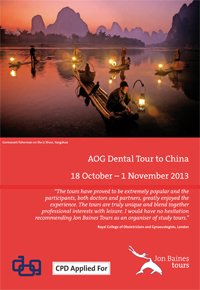 This bespoke study tour was especially designed for AOG members and provided a fascinating insight into China by looking at its history, contemporary culture and medicine, with particular focus on dental health. The tour had a highly practical focus on the uses of traditional Chinese medicine combined with a superb cultural programme that took you to the major sites as well as taking you off the beaten track to offer an insider's view into China. There was a solid professional programme and many opportunities to sample the rich and delicious range of regional cuisine within China.